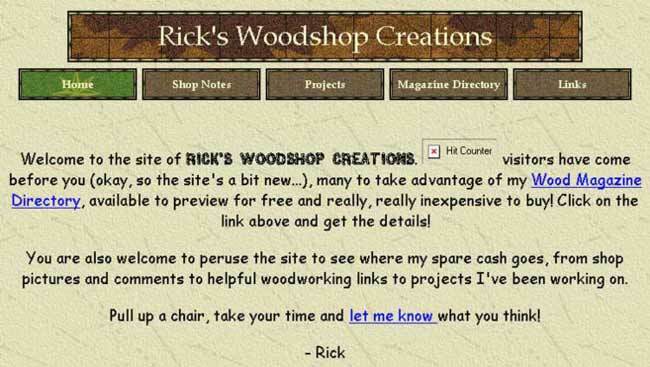 Well, this was my first home page in December 2001. A total of 8 visitors surfed by my site that month. Given that I was just getting my 'webmastering' feet wet, I went with a standard FrontPage template. Not the most attractive collection of graphics and colors in the world, but it worked. And though the site was pretty small, I at least had a presence on the web. As to the hit counter, it just recorded hits, unlike the hidden 'unique visitor' counter I use today which is more representative of site traffic (as of February 2010 it had recorded over 1,350,000 unique visitors to my site and 4,000,000 page views).